S. aghensis and S. bragae (formerly known as S. sp. "Ibitioca"), with their purple bell-shaped flowers and tall flowerstalks, bear a distinct resemblance to one another. Pictures and a table on this page compare the two species. The flowers of S. bragae are larger, and the outside of the tube is glossier. S. aghensis has a white streak with large purple spots along the base of the corolla. The flower of S. aghensis is slightly redder than that of S. bragae. S. bragae has a yellow stripe deep in the corolla tube, but no large spots. S. aghensis has a distinctly two-lipped stigma, with a deep horizontal groove between the two lobes, while S. bragae has only a shallow groove between the lobes, so that the stigma looks blunter. The ovary of S. aghensis is suffused with purple and topped with two very prominent nectaries, the other three being smaller. S. bragae has a white ovary and the five nectaries are approximately the same size (rather small). Tuber multi-lobed with runners Single "bagel"
In addition to the similarity of their blooms, these two species have another property in common, which can be seen from these pictures. The picture to the left shows a seedling of S. bragae. Note the dark leaves. The leaves on a mature plant are an ordinary green. 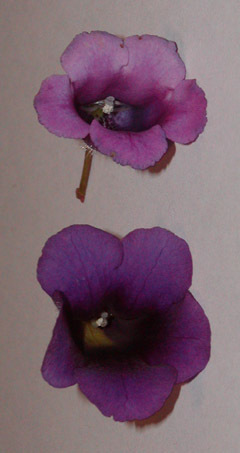 The picture below shows gesneriad seedlings. The pot on the left contains a number of seedlings of S. aghensis. This species too has lustrous dark leaves when young. A mature plant has green leaves, although the green is darker than that of S. bragae. 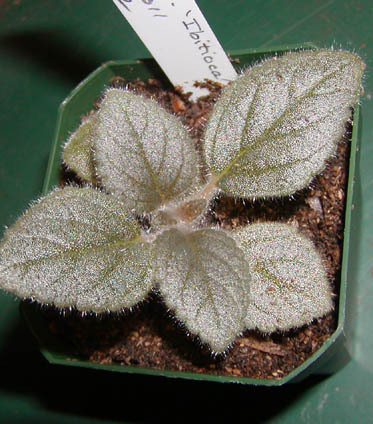 The other two seedlings in the picture are another gesneriad which exhibits a similar difference between juvenile and adult foliage, Corytoplectus congestus.